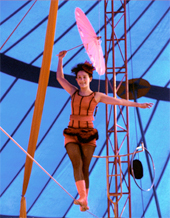 A theatre show on the tight rope. A voyage of two adventurers searching for their destiny. Captain Fiore and Seaman Silver have to face the most incredibile situations on board their strange vessel, made of steel cable. We experience raging storms, arousing of passion, rebellion and mutiny alternating rhythmically with extravagant scenes of everyday life on board. The fusion of the different styles and approaches of the tight rope. 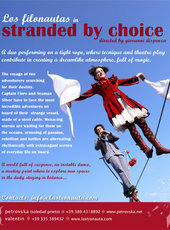 In the research to present their art not merely as a technical demonstration, but with the intention to create an authentic theatre space, they create the show “Stranded by Choice”, where the life of the characters on stage gives the motivation for the action on the tight rope. A stage long and subtle as a steel cable maintains the choice to accept the risk of falling, as well as in every day life, finding the right balance is due to constant research. 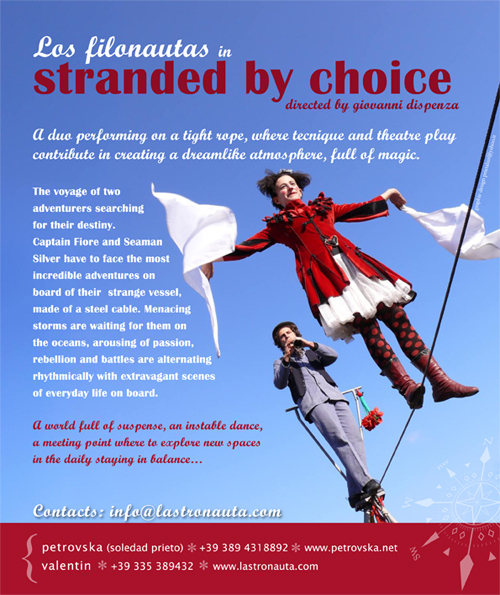 The duo “Los Filonautas” is the fusion of l'Astronauta and Petrovska (www.petrovska.net, Argentina), participates beginning from 2007 in festivals and events of street theatre in Europe, mostly in Italy, Germany, Switzerland, Austria, France, Nederland, Macedonian and Croatia. The last version of the performance was created in Fall 2009 and Winter 2010 with the direction of Giovanni Dispenza (Italy). Collaboration in the phase of creation with Luca Clarioni (Italy), Marie-Anne Kergoet (France), Stefano Corrina (Italy). During 2011 “Stranded by Choice” was presented with success in european festivals, between other they win the first price of the children jury in the youth theatre festival: “Luglio Bambino” in Campi Bisenzio, Florence.